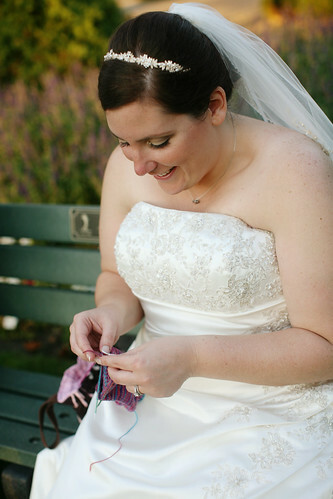 Knitting Like Crazy: Yes, I knit on my wedding day. 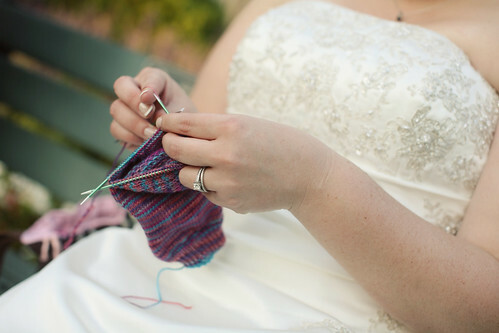 Yes, I knit on my wedding day. I know I have posted lots of wedding stuff on the blog lately, but I couldn't resist posting this last set of pics. Our photographer, Lindsay*, made sure to tell me to bring my knitting along on my wedding day. And, since Jenni was in the wedding, I told her she had to bring hers too. This was one of my favorite parts of the day. It was the perfect little break among all the craziness. 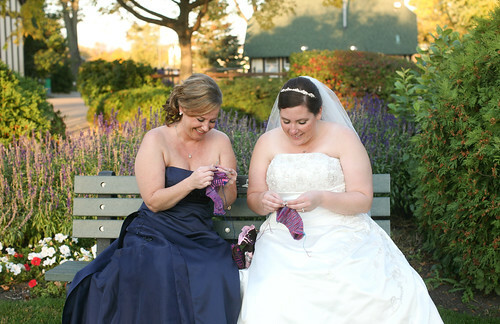 Jenni and I made sure to have knitting with us that coordinated with the wedding colors of pink and navy blue. Jenni is knitting with some yarn I dyed her to match the wedding, and I am knitting with Blue Moon Fiber Arts STR lightweight in the FemmeBot colorway (which Jenni had bought me). *Lindsay and her husband, Ken, are seriously the best photographers ever. Hire them for your wedding, family photos, I don't care. They are soooo awesome.